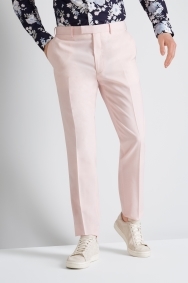 Show your personality in pink but still look sharp thanks to the crisp slim fit of these French Connection trousers – ideal for special occasions. For a tailored look that’s as sophisticated as you, choose the elegantly tapering style of slim fit trousers. Cut close to the body for a streamlined silhouette, this fit is on trend yet highly versatile. Pair with a slim fit shirt for ultimate definition of your shape and a smart ensemble that will take you from morning meeting to date night in style. Delivery came too late. I asked for next day delivery before noon instead i recieved my item 2 days later! It ruined my confort zone for my wedding. So upsef. If only you had packed up the item from the warehouse quickly and gave it to dpd on the day i could have got the item the next day.